Young and hip vegetarians and vegans in Ottawa need no longer dine at their parents’ hippie hangout. Pure Kitchen opened roughly a year ago, and it is still going strong. Thus, the wait time on a Saturday night of 45 minutes. This was my order, and therefore, the only one I can comment on. 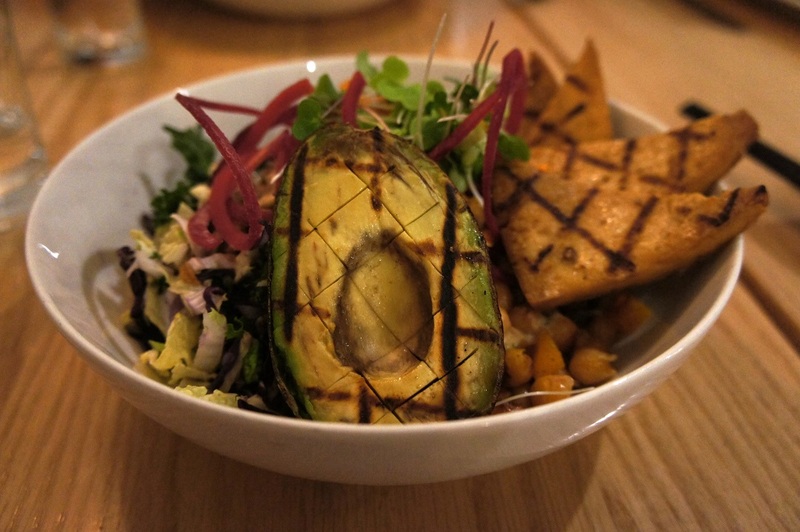 The grilled avocado was tasty, but I thought the dish could have been more multi-dimensional in its flavour. I cannot help but compare the bowl to the ones at Fresh Restaurants in Toronto, which has had 16 years to perfect its menu. This was the appetizer that had my local guides insisting that we wait the 45 minutes, even though we were all starving. I wish the sauce was not so sweet, though everything else about the dish was so delicious that I kept eating, in spite of my objection. Hopefully, Pure Kitchen will work to improve its dishes, in spite of its obvious success. Vegetarian and vegan diets are becoming more mainstream, and it is only a matter of time before Pure Kitchen faces stiff competition in Ottawa. Next Noonas Over Forks is Two Years Old!